After the hail, the sun comes out. Most of the plants are now beginning to show signs of recovery and even the lettuces which appeared entirely crushed by the strength of the storm have perked up and may yet make hearts although they'll never be as beautiful as they were. I told my French teacher about the hail last night. He said they'd had nothing like it in the village but that 'in the forest anything might happen'. I'm beginning to get an idea of how the locals view this place, very nearly as enchanted as we think. There were deer prints on the vegetable patch when I went out this morning. No signs of other damage but worrying enough. They seemed to dislike the softer ground and had moved off fairly quickly but I doubt that will be enough to discourage them if they get a taste for pea plants or garlic. 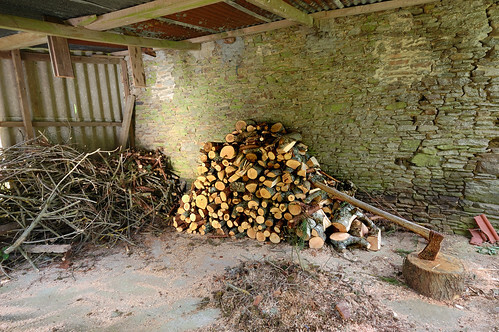 Today my task, apart from mowing some more, is to finalise our draft (if that's possible) of plans for the tractor shed. We need to get that moving and if I write it down here maybe it will finally happen. And I had an email this morning. They will be cutting for hay while the sun shines. They'd better hurry then, the BBC and the Meteo both claim it will be raining again by the weekend.